Now do I have your attention? Good! This Audemars Piguet Huitieme Chronograph comes in a conventional and wearable 40.5 mm case made of tantalum with rose gold accents. Note that the “cyclops eye” over the date is inside the crystal (a rare arrangement) rather than on top as is common with Rolex and many others. The side view really shows off the gray and gold contrast and highlights this thin movement. 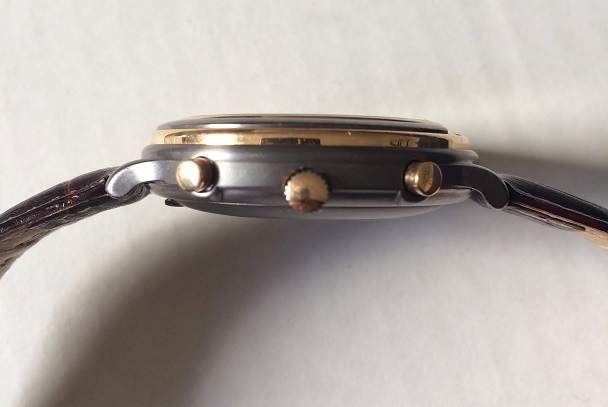 It’s also obvious by the offset between the pushers and the crown that this was an ebauche and chronograph movement, not an integrated calibre. Based on the Jaeger-LeCoultre Calibre 889, Audemars Piguet’s 2126 was commendably thin and well-finished. AP owned 40% of struggling JLC at the time, so this was not an unusual supplier arrangement. Incidentally, the same ebauche was also used by IWC in their Mark XII, and is prized by collectors. AP continued this calibre line with the 2226 and 2326, and it’s often called a “manufacture” movement in contemporary literature. “Huitieme” (or “Huitiesme” in old French, meaning “eighth”) was Audemars Piguet’s prestige line in the 1970’s and 1980’s but is mostly forgotten today under the weight of all those Royal Oak models. In those years, though, these clean watches, complete with “Audemars Piguet” signed at the top of the bezel, were quite a competitor for Vacheron Constantin, Jaeger-LeCoultre, and even Patek Philippe. 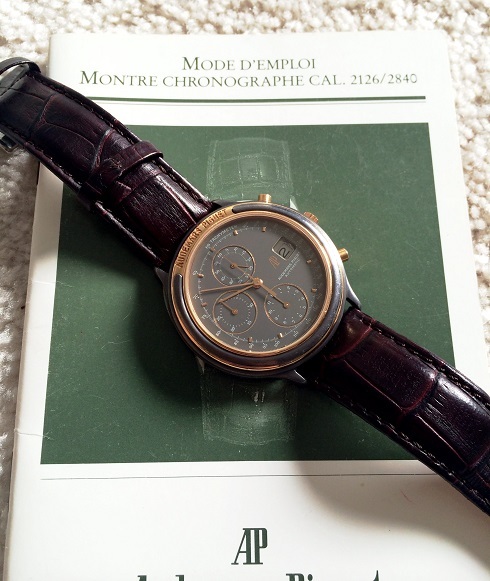 And this chronograph was the cream of the crop! 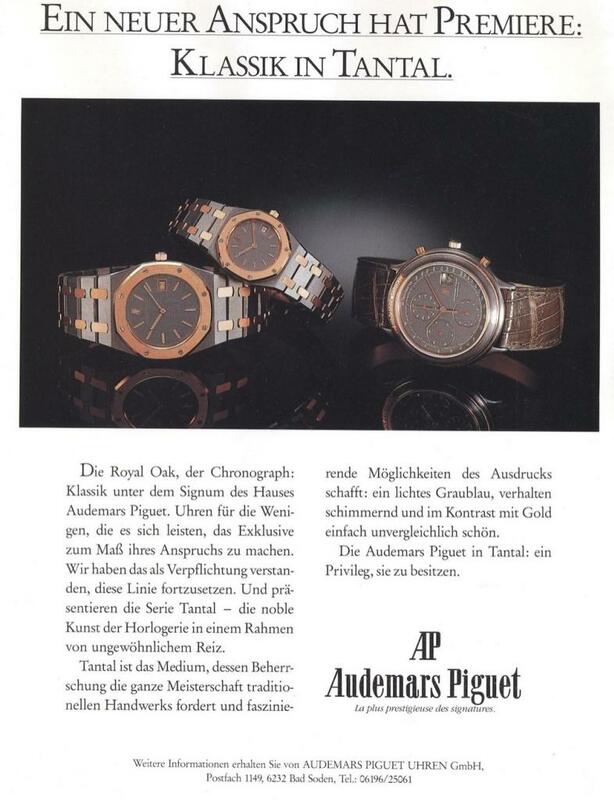 The vintage ad below shows the Huitieme Chronograph alongside the related tantalum and gold Royal Oak models. If you’d like a strikingly unusual chronograph watch in a unique case from a famous brand, this is your best bet. It’s affordable and you’re likely to be fielding questions about it from watch enthusiasts and novices alike. What more could you want for less than $6,000? 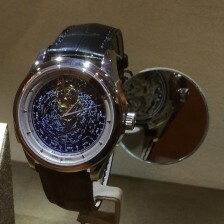 Find it here on PuristSPro or here on Watchuseek. What If Your Company Gave You a Limited-Edition Gold Patek Philippe?